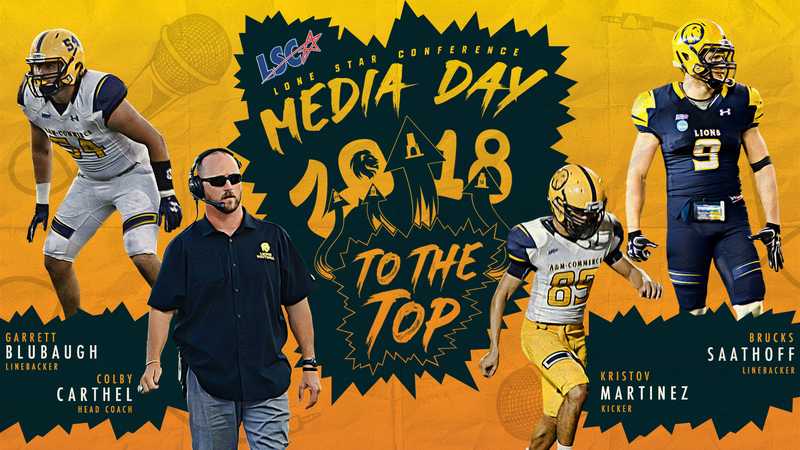 Lions to participate in annual LSC Media Day on Tuesday, July 24. SAN ANTONIO – The 2017 National Champion Texas A&M University-Commerce football team will participate in the annual Lone Star Conference Media Day on Tuesday, July 24, at the San Antonio Marriott Riverwalk. The Lions will be represented by head coach Colby Carthel, linebacker Garrett Blubaugh, kicker Kristov Martinez, and linebacker Brucks Saathoff. The head coach and selected players from each of the LSC’s nine football teams are slated to attend and be interviewed. During the event, league officials will announce the preseason poll and players of the year. The day begins with registration followed by lunch, a brief program, remarks from each football coach and student-athlete and an open interview session. The event will be streamed live via Facebook at https://www.facebook.com/LoneStarConf/ starting at Noon. The Lions went 14-1 with five playoff victories, clinching the NCAA Division II National Championship with a 37-27 win over West Florida. A total of 43 letter winners and 14 starters – five on offense and nine on defense – return for the Lions, who closed the season on a 10-game winning streak, which is the longest active winning streak in Division II. The Lions are entering their sixth season under Carthel and are looking to make their fourth consecutive NCAA Division II Championship appearance and sixth straight postseason appearance. Carthel was named the inaugural Coach of the Year by the Gridiron Club of Dallas and was also named the Super Region Four Coach of the Year by Don Hansen’s Football Gazette. Blubaugh – a redshirt junior from Keller – returns as the Lions’ second-leading tackler. Blubaugh made 84 stops in the National Championship season, and excelled in the playoffs, making 43 postseason tackles with double-digit tackles in the regional final, and the National Semifinal wins. He had a career-high 15 tackles at Minnesota State and followed that up with 10 stops against Harding. He also had an interception in the comeback win over Central Washington in the regional semifinal. Blubaugh was the football winner of the NCAA Elite 90 Award, which recognizes the top grade point average at the national finals site. The biological sciences major was also a Lone Star Conference All-Academic selection. Martinez – a senior from Edinburg – is on pace to challenge LSC & NCAA records after one of the top seasons in program history. Martinez made 24-of-28 field goal attempts in the 2017 season, tying the LSC record for most field goals in a season and becoming just the sixth Division II player to have 24 field goals in a season. He is now 54-of-71 on field goal attempts in his career, which ranks 14th in Division II history. The Division II career record is 82 made field goals. Martinez is the Division II active career leader in made field goals and ranks third in all NCAA divisions behind Wisconsin’s Rafael Gaglianone (60) and Toledo’s Jameson Vest (57). Those three kickers are the only NCAA players entering 2018 with more than 50 field goals to their credit. Martinez also connected on 65-of-66 PAT attempts and had made his last 52 in succession. For his career, Martinez has made 176-of-183 PAT efforts and is the Division II active career leader. Martinez also excelled in the kickoff game, averaging 54.9 yards per kickoff with 44 touchbacks on 101 kickoffs. The Lions led the nation in kickoff return defense, as their opponents averaged only 11.67 yards per return. Martinez’ 44 touchbacks tied the team for the second-most in the nation with Minnesota State behind Indianapolis (47). He has been named a second-team preseason All-American by Lindy’s. Saathoff – a senior from San Antonio – has led the Lions in tackles for the last two seasons. In 2017, Saathoff was the Lion leader with 101 tackles, averaging 6.7 stops per game. For his career, Saathoff has 209 tackles, which is the leading mark for the Lions. His 12.5 career tackles for loss is the second-leading returning mark on the squad. Saathoff and safety Chris Smith are the only two returning defensive players to have played in all 39 games in the last three seasons. Saathoff was a first team all-Lone Star Conference selection at linebacker in 2017 after earning honorable mention all-LSC in 2016. Don Hansen’s Football Gazette honored Saathoff with second team all-region honors and honorable mention All-America. Saathoff was also one of 30 Division II finalists for the Cliff Harris Award, which is presented to the top defensive player in the country representing Division II, III and NAIA colleges and universities. Saathoff had double-digit tackles in four games during the National Championship season, led by a season-best 14 tackles in the National Semifinal win over Harding. Saathoff made 42 tackles in the five playoff games for an average of more than eight stops per game in that crucial stretch. For more information on LSC Football Media Day, please visit www.LoneStarConference.org. Chris Smith nominated for the 2018 Allstate AFCA Good Works Team®. NORTHBROOK, Ill.– Texas A&M University-Commerce senior defensive back Chris Smith has been announced as one of 169 nominees for the 2018 Allstate AFCA Good Works Team®, one of the most prestigious off-the-field honors in college football. For a student-athlete to be in consideration by Allstate and the AFCA for a nomination, each player must be actively involved with a charitable organization or service group while maintaining a strong academic standing. Smith is one of 99 scholar-athletes from the Combined Divisions (FCS, Division II, Division III and NAIA) vying for 11 spots on the Good Works Team. Since its inception in 1992, the award shines a spotlight on selfless student-athletes and honors their dedication to volunteerism, community service and their commitment to enriching the lives of others. While players are often recognized for their accomplishments and achievements on game day, these student-athletes have made significant contributions to the greater good of society, inspiring future generations of young athletes and the broader college football community. During the 2017-18 academic year, Smith participated in numerous charitable activities and was a member of several student organizations at Texas A&M-Commerce dedicated to community service and enrichment. He was the chair of the 2017-18 Athletes in Action organization and was a member of the Football Leadership Council. Smith has also been a representative on the Student-Athlete Advisory Council (SAAC) in all three of his years at A&M-Commerce, an organization which annually ranks near the top of Division II in community service and engagement. Smith participated in several events benefitting the Make-A-Wish Foundation, participated in numerous “Education Days” on campus, where student-athletes host elementary students at events, and was a participant at all Lion kid’s football camps and participated in events such as Clothe-A-Child, AIA Prayer Tent, and the Adopt-a-Highway cleanup. As a member of the football team, Smith joined his teammates in helping clean Port Aransas after the devastating effects of Hurricane Harvey and was a part of the team’s fundraiser to honor the memory of MSU football player Robert Grays. On the field for the 2017 Lions, Smith was a significant contributor to the school’s first-ever NCAA Division II Championship. He was named Second Team All-Conference on one of the stingiest defenses in all of Division II, which allowed just 16.7 points per game. He was named LSC Defensive Player of the Week after causing a safety in the opening game of the season. Smith played in all 15 games and recorded 44 tackles, including 16 tackles in the team’s five playoff games. The student-athletes who are nominated for this award not only demonstrate a unique dedication to community service and desire to make a positive impact on the lives around them, but they also show tremendous perseverance as well as the ability to overcome personal struggles and come out victorious against all the odds. Comprised of 11 players from the NCAA Football Bowl Subdivision and 11 players from the NCAA Football Championship Subdivision, Divisions II, III and the NAIA, the final roster of 22 award recipients will be unveiled in September. From the nominees submitted by sports information directors across the nation on behalf of their schools, a special voting panel consisting of former Allstate AFCA Good Works Team® members and prominent college football media members will select the 2018 Good Works Team®. Two-time national champion, Heisman Trophy winner and 2009 Allstate AFCA Good Works Team® member Tim Tebow will headline the Allstate AFCA Good Works Team® voting panel. The Allstate AFCA Good Works Team® was established in 1992 by the College Football Association, recognizing the extra efforts made by college football players and student support staff off the field. AFCA became the governing body of the award in 1997 and continued to honor college football players who go the extra mile for those in need. Allstate worked to present the award starting with the 2008 season. 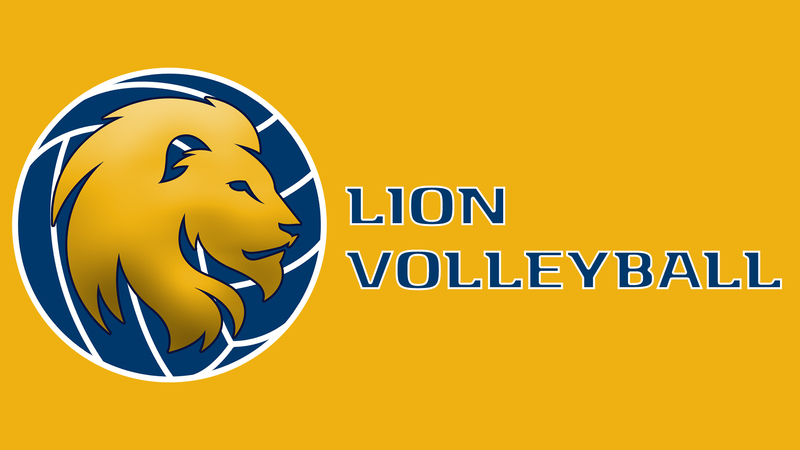 Lion Volleyball earns AVCA Team Academic Award for the 2017-’18 season. LEXINGTON, Ky.– The Texas A&M University-Commerce volleyball team has earned the American Volleyball Coaches Association 2017-18 Team Academic Award, as announced on Monday by the AVCA. It is the second time in the last three seasons the Lion volleyball team has received the award and the third time in program history. The award, which was initiated in the 1992-93 academic year, honors collegiate and high school volleyball teams that displayed excellence in the classroom during the school year by maintaining at least a 3.30 cumulative team grade-point average on a 4.0 scale or a 4.10 collective team GPA on a 5.0 scale. A&M-Commerce is one of 128 schools from NCAA Division II to receive the award, and one of four teams from the Lone Star Conference. Earlier this month, the Lion volleyball team was recognized as the LSC Academic Champion for its sport, recording a team GPA of 3.403. During the 2017 season, Jaslyn Wacker was named the LSC Academic Player of the Year and was named the program’s first CoSIDA Academic All-American. She was joined by Jaryn Wacker on the LSC’s All-Academic team. 14 players from the team earned recognition on the LSC Commissioner’s Fall Honor Roll while 13 members of the team made the Commissioner’s Spring Honor Roll. The Lion volleyball team was just as successful on the court during the 2017 season, recording 21 wins and finishing in second place in the LSC. The Lions would go on to qualify for the NCAA Division II Championship tournament for the first time in 29 years. The 2018 Lion Volleyball season will begin on August 24.